This is an alternate version of epic mythology MAHABHARATA in which Arjuna does not accept the advice of Shri Krishna to go to war against Kauravas and advises Yudhisthira to accept the decision of Bhishma. Dussala, sister of Duryodhana, wants to marry Karna. She and her mother seek the intervention of Bhishma. Bhishma, who alone knows that Karna is not a sutaputra but love child of Kunti, approves the marriage and discloses the true identity of Karna and chooses him as the next ruler of Hastinapur. Thus son of Kunti and daughter of Gandhari succeed Dhritrashtra and the internecine war is avoided. 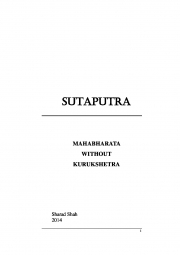 This is the first and probably the last book written by the author.He wrote it because he could not accept that God should advise Pandavas to go to war with Kauravas and resort to unfair means to win. In the book, he explores what if Arjuna rejects the advice of Krishna in Gita and refuses to fight and kill his own cousins.